Originally posted: July 9, 2018 . Last modified: April 13, 2019 . 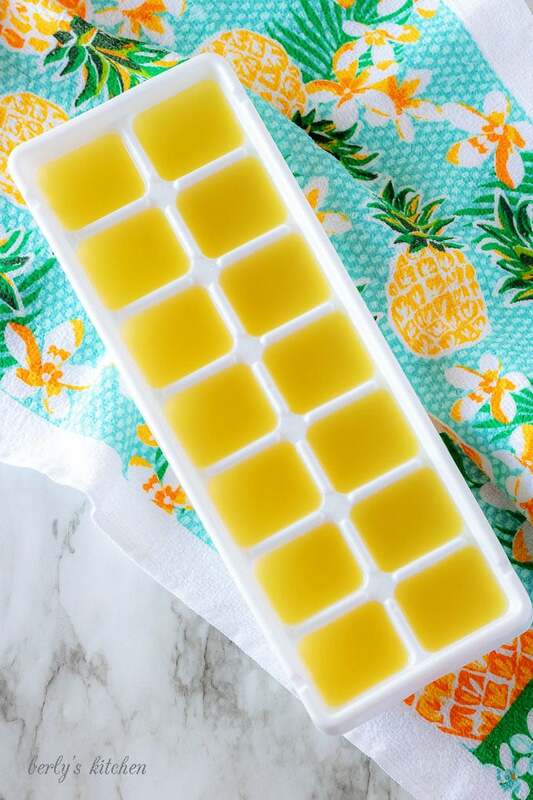 Summer is here and we’ve got a great way to cool off, tropical cocktail booze cubes. 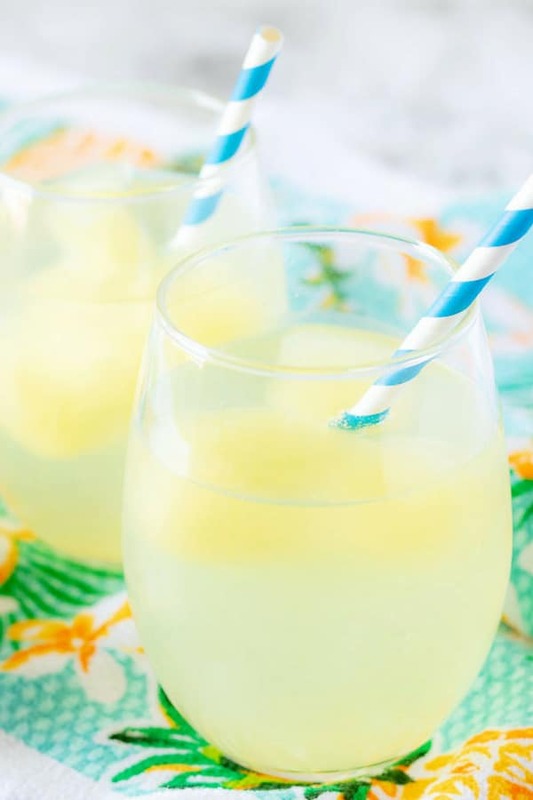 Coconut water, pineapple juice, and rum frozen and ready for your glass! A few months ago, Kim and I decided to poll our followers on Facebook and ask them what kind of recipes they’d like to see from us this Summer. Overwhelmingly, mixed drinks and salads seemed to be what we heard about the most. So, we set about creating posts that echoed what our followers desired. Kim started to work on the salads and I took the drinks. For today’s post, I bring you booze cubes. A mixed drink, perfectly frozen, that can be dissolved in a liquid of your choice. I chose sparkling water so you could see how pretty the melting cocktail looks when served. Feel free to change things as you desire; additionally, I will be providing for extra tips in the instructions below. First, grab all of your ingredients in advance to make the preparation process easier for you. 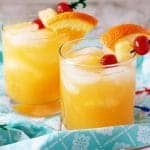 Using a large pitcher or blender, combine the pineapple juice, coconut water, and rum. You don’t have to mix everything in the tools I listed, as long as the container used can hold more then 30-ounces you should be good to go. Next, pour the mixture into a large ice cube tray. 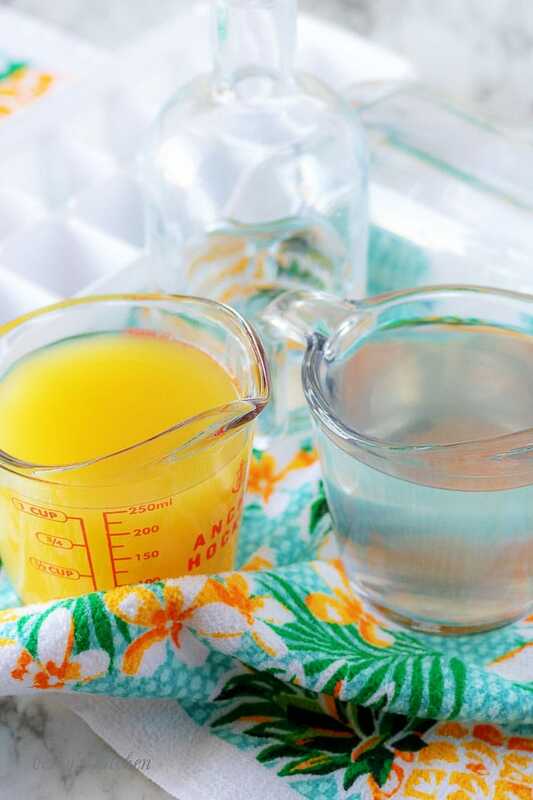 Now, chances are you will have left-over tropical cocktail drink mix. It’s okay, use it however you see fit. For example, pour it into another ice cube tray or into a popsicle mold to make boozy popsicles. Moreover, you could get really creative and cook it down into a sweet dessert sauce for angel food or pound cake. Last, place the ice cube tray into your freezer for at least 8-hours. Now, I recommend leaving the tropical cocktail booze cubes to freeze overnight. Don’t pull them too early or you will have a sticky mess on your hands, literally. 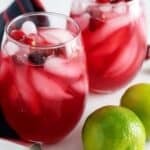 Once the cubes have frozen, drop 3 of them into 8-ounces of liquid (your choice) and serve them in stemless wine glasses, cocktail glasses, or even Collins’ glasses. Garnish the drinks with fresh fruit like lime, lemons, or even strawberries. We’ve a list of tasty drinks to keep you cool this Summer! Like our Lemonade Tequila Drink or these Rum Mixed Drinks. Remember, if you don’t like the booze, then just remove the alcohol and enjoy virgin versions of either beverage! Summer is here and we've got a great way to cool off, tropical cocktail booze cubes. 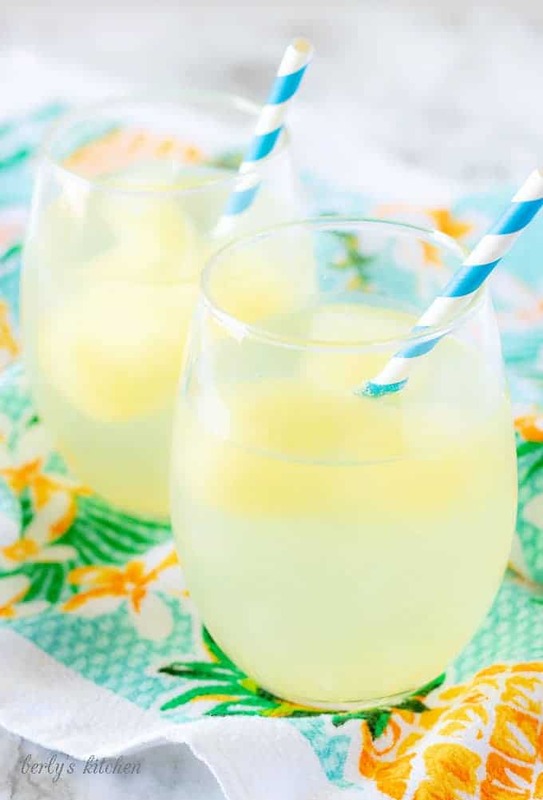 Coconut water, pineapple juice, and rum frozen and ready for your glass! First, in a large pitcher, combine the pineapple juice, coconut water, and rum. Last, freeze overnight and then serve 3 cubes in a cocktail glass with about 8 ounces of sparkling water. Garnish with fresh fruit like lemon or lime wedges. 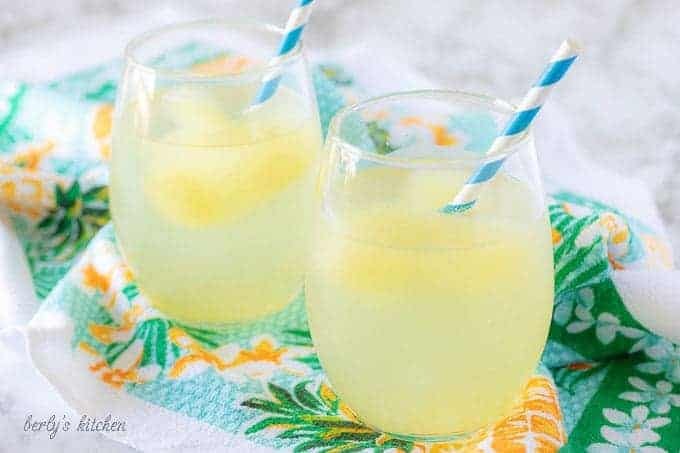 The calories listed are an approximation based on the ingredients listed and a serving size of 3-cubes dissolved in 8-ounces of sparkling water. Actual calories will vary depending. I recommend leaving the ice cubes to freeze overnight and for faster melting serve them in room temperature sparkling water. I love this idea! I think I will make them for my end of summer party! I think I need a booze in this scorching hot summer. Your Lemonade Tequila drink and Rum mixed drink and this Cocktail Booze will do the trick of cooling me down. Love this recipe.It is simple and cooling. I love mushroom soup and I often make wild rice but I have yet to try rice in my soup. Sounds so good and looks so delish. Can’t wait to try this. Saving for later. I love making booze cubes but have never made it with rum or coconut water! I have both of those ingredients as well as the juice! I can’t wait to try your recipe and plunk them in my sparkling water!! What a fun way to fancy-up a drink! And I love the alternate suggestions you give for ways to use the mixture. Boozy popsicles are a perfect treat! No beach or tropical vacation for us in quite a while, but now thanks to these, we can take a quick trip anytime we want! What a perfect recipe! Love this idea. I’m pinning it. We’ve always frozen juice cubes for our Sangria. Why water down a perfectly good drink, right? Now, you can sip your drink, enjoy an adult beverage, and keep it tasting good. This recipe is a keeper!! Well, this sounds refreshing! I’ll be trying out on my next pool day. Thanks for sharing! What a great way to essentially have pre-mixed cocktails ready to go! This sounds like a great way to avoid having someone man the bartending station at a BBQ so everyone can enjoy themselves. 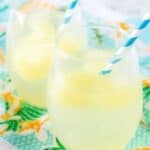 The perfect summer cocktail!! I love that you used rum in this drink. Sounds perfect for a summer treat. Well sign me up for these Booze Cubes! What a great idea. Love that you can add them to any liquid. SO fun and they look gorgeous!